Sitting next to Westport Board of Education Chair Mark Mathias, Superintendent Colleen Palmer gave her recommendation to close the Coleytown Middle School building to students for the duration of the school year. Photo taken at the Board of Education meeting at Staples High School on Oct. 15. WESTPORT — Superintendent Colleen Palmer will not return to Westport Public Schools, Board of Education Chair Mark Mathias said. “For the remainder of her employment with the board, Dr. Palmer will be on leave for medical reasons,” Mathias said at Monday’s Board of Education (BOE) meeting before the board unanimously voted on Palmer’s separation agreement with the BOE. “Transitions are inevitable and this is one of those times when there is a transition. Her retirement was announced earlier this year and so given this new information we’re helping move the district along and forward,” Mathias said, thanking Palmer on behalf of the BOE for her three years of service in Westport. In Palmer’s place, the BOE appointed Anthony Buono, currently Assistant Superintendent, to the position of Acting Superintendent of Schools. Buono will serve in the role “on a short-term basis,” Mathias said. “Dr. Buono is our acting superintendent of schools. We are in fact looking for a interim superintendent of schools. We don’t yet have a date for when that will occur,” Mathias said. 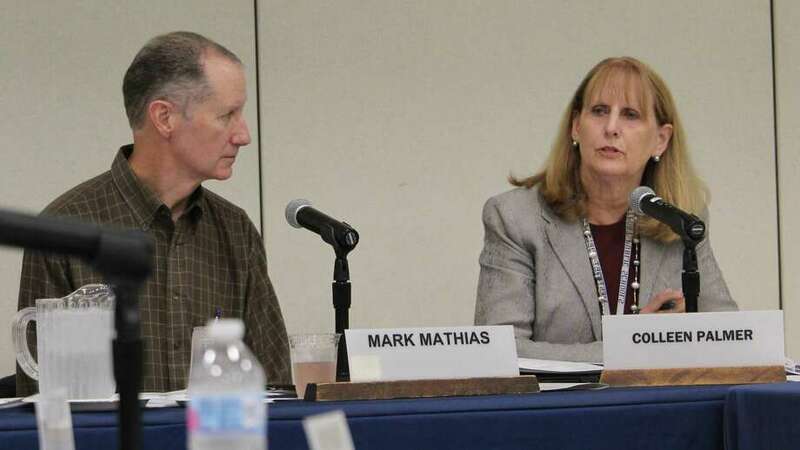 “We’ll probably have an interim superintendent for next year,” Mathias said in a March 27 interview with the Westport News, noting the BOE will likely conduct a search for a permanent superintendent while the interim is in charge. “I’m honored to accept the position until the board is able to find a suitable replacement,” Buono said. Palmer’s separation agreement stipulates she will receive her full salary until she leaves Westport schools in August. Last year Palmer topped the list of Westport’s highest-paid town employees, with a salary of $300,411, which means Palmer will be paid a salary of about $5,777 per week and $138,648 in total while away on medical leave until her contract ends. The terms of Palmer’s retirement package were not stipulated in the separation agreement. Palmer announced her resignation from the district on March 14, at which time she said she planned to retire effective Aug. 1. Palmer did not return to the district after she told administrators she would be away due to a “family emergency” on March 22, at which time Buono took charge, although his title as Acting Superintendent was not solidified until Monday’s meeting. In leaving Westport, Palmer concludes a 35-year career in the education sector in Connecticut, which included time as principal of Simsbury High School, Hamden High School and Nonnewaug High School. Palmer was named Superintendent of the Year by the Connecticut Association of Public School Superintendents in 2016, but has had a difficult tenure in Westport. For the past two years, Palmer sparred with town’s Board of Finance over the education budget, and this year faced significant criticism from parents who said Palmer poorly handled the closing of Coleytown Middle School due to issues with mold. Acting Superintendent Buono came to Westport last July to serve as the assistant superintendent of teaching and learning, and before that worked as the associate superintendent for Branford Public Schools.